I’ve turned the corner and am heading into the home stretch now. Work today consisted of tidying up the few remaining loose ends with the setup. A couple photographers came in today and a couple people from broadcasting. All in all, it was a much more comfortable pace today than it has been for the past two weeks. With any luck, we will have tomorrow off completely. We’re thinking about going to the Minnesota State Fair in the afternoon and then to the media reception hosted by the GOP tomorrow night. So I took the opportunity of the little bit of down time to take some pictures. 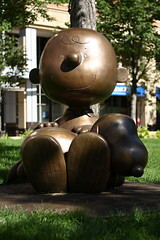 I had noticed a collection of statues of Peanuts characters in Rice Park near the convention site. Charles Schultz grew up in the Twin Cities. He was born in Minneapolis and spent most of his formative years in St. Paul. The statues are life-sized and taken from classic poses found in his fifty years of Peanuts strips. 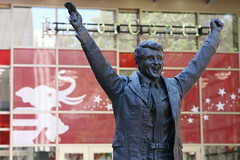 I also got what I hope you will find a humorous picture of the Herb Brooks statue on the east side of the Rivercentre. He looks so excited, and with the backdrop of the RNC decorations, I could not pass up the opportunity to shoot him, too. 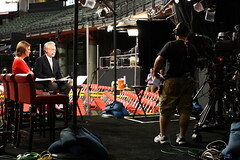 Wolf Blitzer and Gloria Borger from CNN arrived on site today and began doing live shots for “The Situation Room”. Anderson Cooper had been with the two of them in Denver, but he has headed to New Orleans with James Carville to monitor the developments with Hurricane Gustav. I guess it’s easier to see the satellite images and make vague, emotional comparisons to Hurricane Katrina when you’re actually in Louisiana. I don’t know. I’m the new guy. On a more serious note, hurricanes are no laughing matter. Hurricanes are the most powerful weather phenomenon on the planet. A hurricane cannot be stopped, dissuaded or redirected. And while I agree that there is a story in covering this storm as it moves out of the the Caribbean and into the Gulf of Mexico I am troubled by the repetition of comparisons. Rumors have been circulating the Xcel center most of the day concerning the possibility the Republican National Committee may postpone the convention due to the possibility of Hurricane Gustav making landfall in Texas or Louisiana on Tuesday or Wednesday. I do not know when they committee might make that call. I suspect they will want to delay as long as possible before they do. Given the amount of planning and coordination that went into this convention– I am not just speaking for me, but for the party, the delegates, the media in general– a delay would mean a massive disruption. I will keep you posted as I learn something. The other big story around “The X”– I learned that is the local nickname for the Xcel Energy Center– is John McCain‘s choice of Sarah Palin as his running mate. It came as quite a surprise to most everyone, and there was a mad scramble for information on her. I provided a very small amount of assistance to a member of the Los Angeles Times western bureau trying to get some sort of Internet connectivity to file a story from Alaska concerning background information on Palin. We ended the night over on Grand Avenue, an older St. Paul neighborhood that lives up to the name. Large Victorian homes overlook the Mississippi River, upscale restaurants and nightlife along broad tree-lined streets. But the highlight of the evening was visiting the Grand Ole Creamery. Ice cream heaven on a gorgeous summer evening. It was the perfect way to relax after twelve straight days on the road.